Reflections and memory, a photo by The Bacher Family on Flickr. For this Mother's Day, a beautiful photo by the mother in our family. Of all the pictures Kelli took during her trip to Washington DC with David's 8th Grade class, this is the one that resonates with us most deeply. A simple image of David t the Korean War Veteran's Memorial, on the one rainy day of the trip -- and this memorial is so appropriate in the rain, with the statues of soldiers slogging through the fields in their rain gear, and the reflections etched into the wall supplemented by the reflections of wet granite. 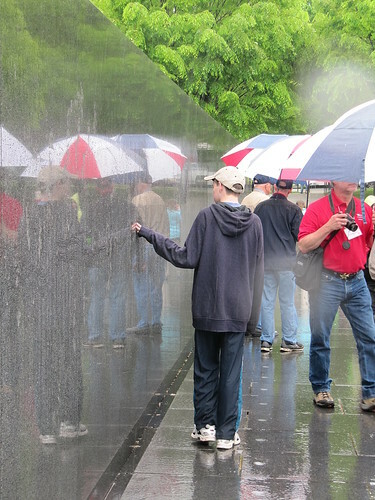 Add an array of colorful red, white, and blue umbrellas and clothing; and a young man -- only a few years younger than the soldiers memorialized in the monument -- connecting with our history both physically and symbolically; and a pair of converging lines drawing your eye into the picture; and it's a powerful image. Good job, sweetheart -- great photo.